What is your Focus, Astonishing Actions or Admonishing Words? Moving across state lines to help plant a church was an unexpected calling giving me a wake-up call! This faith move revealed how stale my relationship with God had become. For years I had given counsel, taught, mentored and supported many individuals and groups for the sake of God’s kingdom. As I look back, I realize I had become comfortable with my relationship with God. I had many opportunities to admonish others to make their relationship with God a life priority. These astonishing acts of bringing unrequested food to a family in need, delivering mattresses when the driver’s mother passed away, mowing a new neighbor’s lawn when a dad was in the hospital then paying the month’s rent, driving a dad an hour one way to a hospital for a day of chemo…the list goes on. These actions were unexpected by the recipient and hard to understand why. “Why would someone do that for me!” was the common response to these uncommon actions. “Because God loves you” was the true explanation that prompted more exploration into the who and what about God. The proconsul, a Roman governor, in Acts 13 was seeking to hear the Word of God. He invited Paul and Barnabas to teach him about the word of God. The sorcerer, Elymas, did not want him to believe and was attempting to thwart the teachings of Paul by perverting the true ways of the Lord. With the power of the Holy Spirit, Paul caused a darkness to come over Elymas and he became blind. The scripture says the governor believed when he saw what happened and the teaching concerning the Lord also astonished him. The teaching was about ” the salvation in the kingdom of God attained through Christ.” (Acts 13:7 AMPC) The salvation truth astonished this “intelligent man of sound understanding”. The Greek word for astonished literally means to “strike with astonishment”. The Truth of God’s love BLEW HIS MIND! Are you astonished at the message of salvation? Are you excited enough to be motivated to give in sacrificial, unexpected ways to neighbors and people God puts in your life? Or has the world perverted God’s love in your heart? God’s children powerfully reveal the reality of God’s love to an unbelieving world through astonishing acts of love. I am learning that admonishing words of correction from an experienced Christian is not as effective as the unselfish acts of a new believer. The astonishing actions are an outflow of an astonished heart. 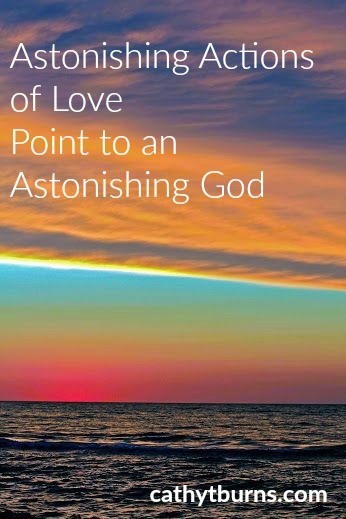 Astonishing actions of love point to an astonishing God. We must show, not just tell others about the amazing love of God. The rewards of peace and joy will be astonishing! Nice! What a great reminder, simple yet so hard. Lord, be my one and only! This is wonderful! Thank you for the reminder of how to show God’s love instead of admonishing to try to exclaim His love.